Well I'm man enough to admit I didn't see the 2 different camera models. At a focal length of only 80 mm you were very close. Lucky you the lioness didn't jump into your vehicle. LOL! I wish I could Photoshop that well! Check the info again. One shot was taken with a D200 and the other with a D70. I -thought- the clocks were synced, but not so. 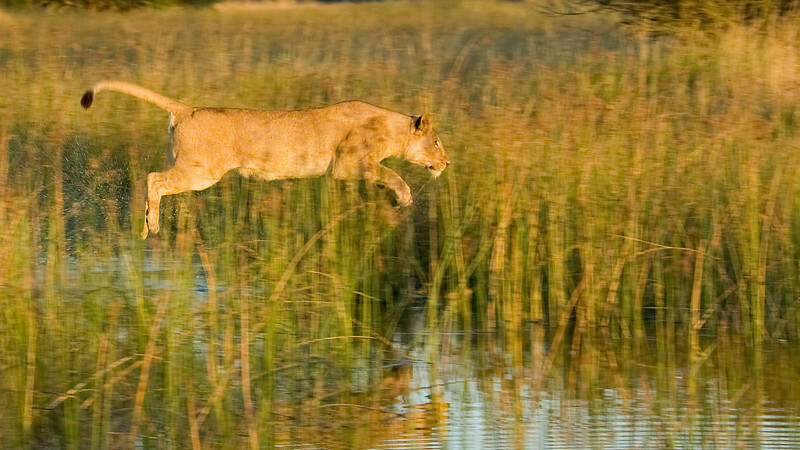 As to the blurred grass, but sharp lioness, that's from panning. One shot was taken at 1/250 of a sec with an effective focal length of 180 mm. (The other was /160 with a focal length of 120.) To freeze the lioness, we had to pan as we shot, which threw everything else slightly out of focus. About why her pads aren't wet, she's jumping across a small stream, not walking in water. Our guide told us the primary predator lions face in that part of the Delta is crocs. It's hard to see from the photo, but she could have easily walked through the stream. But with the high grass it was just deep enough for a croc to be invisible She was very unhappy when she realized she had to make this crossing. She paced back and forth, let out a tremendous roar, then jumped. It was her lucky day, no crocs. These were the only two fairly sharp shots of her, but we we'd have been happy if only one came out. According to the Exif information, the lioness must have jumped backwards, since photo no. 12 (2008-05-06 16:54:18) was taken earlier than no. 14 (2008-05-06 17:48:31). Even if you claim you have captured two very different shots, it is interesting that none of the grass which obviously touches the lioness has been bent bent. Actually the entire grass is blurred, only the lioness is crisp and clear. It is impossible that the DOF didn’t fall on a single blade of grass and put it also in focus. Overall the lioness doesn’t have wet feet and looks like a cardboard cut-out. Congrats to such a masterful PP job.